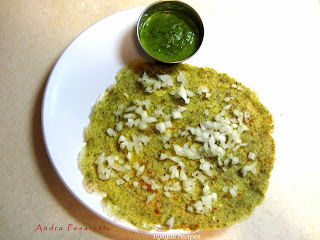 Pesarratu is Very quickly prepared with left over dosa batter.Green gram is used as a digestive, nutritive and aperient. It is good for pregnancy and breast feeding women, as well as children. Eating Green gram regularly increases lactation, helps one to get the required nutrition and promotes well being.Since Green gram are nutritive we prepare Delicious and crispy Pesarratu from it. Green Gram dal - 3/4 cup. Idli/Dosa Batter - 1/2 cup. [refer my link for idli/dosa batter]. jeera (cumin seeds) - 1 tsp. Soak Green Gram 4 to 5 hours or overnight. Grind Green gram,Jeera,green chillies,ginger,Pearl onions in a blender with little water. Take a mixing bowl add Dosa batter, salt and ground green gram mixture to gether,stir well. 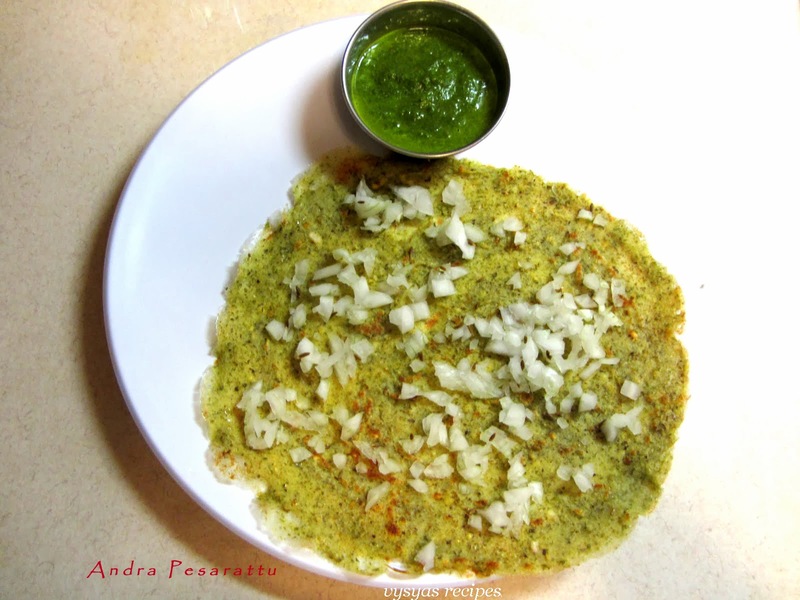 Pour Dosa like normal Dosa.drizzle some oil. Sprinkle some onions upon it,then onion will stick to batter,latter flip the dosa when one side is cooked. when both sides are cooked remove from tawa and serve hot. It goes very well with onion chutney, coriander chutney, coconut chutney,Allam chutney and tomato chutney.